It's a bumper football weekend on Sky Sports - including a Derby Day triple-header. Get the lowdown on what's coming up with our handy guide. Friday Night Football comes from the Cardiff City Stadium as two sides promoted from the Sky Bet Championship last season meet under the lights. Neil Warnock and Nuno Espirito Santo memorably clashed in the second tier when Wolves claimed a dramatic win here last season; they might have since made up but Warnock would relish revenge ahead of his 70th birthday weekend. Claudio Ranieri returns to Stamford Bridge with new side Fulham as Derby Day kicks off in west London. The Italian the opportunity to become the first former Chelsea manager to beat his old club with two different teams in the Premier League but Maurizio Sarri will expect a response from his side after their 3-1 defeat to Tottenham last time out. Unai Emery gets his first taste of the north London derby when Arsenal host Tottenham at the Emirates in another mouthwatering clash. Emery is sweating on the fitness of Alexandre Lacazette for the showdown and must also decide whether or not to recall Mesut Ozil. Harry Kane certainly has a taste for London derbies - he netted 25 times in 39 Premier League capital clashes. The Sky Sports cameras head to Liverpool as Derby Day concludes with a monster Merseyside tussle. Marco Silva is latest in a long line of Everton managers hoping to end a dismal run of 17 meetings without a win against Liverpool. But as well as possessing a fearsome forward line, the Reds have the join-best defence in the league and Jurgen Klopp will hope his players can shrug off Champions League disappointment against PSG to claim local superiority. Former Arsenal defender Lauren, singer Paul Heaton and hip hop musician and actor Loyle Carner join Fenners, Lloyd and Jimmy on the show. 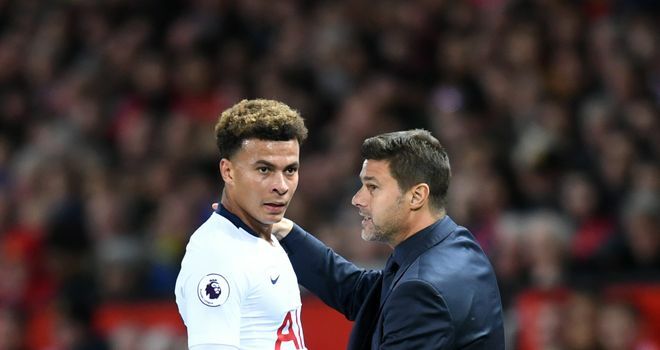 Tubes meets Tottenham's Dele Alli and Doncaster Rovers fans are in the studio for a packed show that includes all your favourites like Megnuts of the Week and Let's All Laugh at Diving. Jeff Stelling is back to guide you through another packed schedule, providing updates of all the goals as they go in, along with plenty of fun and debate alongside Paul Merson, Charlie Nicholas, Phil Thompson and Matt Le Tissier. Neil Ashton will be joined by Henry Winter, Shaun Custis and Adam Crafton at the earlier time of 8am as the clock ticks down to Derby Day. Kammy and Ben Shepherd are joined by Tottenham legend Les Ferdinand to dissect Saturday's action and look ahead to the north London derby.